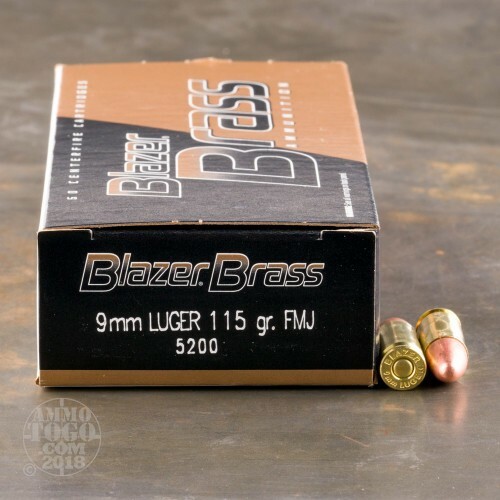 Novice shooters and experienced competitors alike will love the affordable price and dependable performance of these 9mm Luger rounds from Blazer Brass! Blazer Brass is a sister company to the Speer and CCI groups and uses high-quality components from each. These include reloadable brass casings, clean-igniting Boxer primers, and bullets with covered bases; this construction effort cuts down on lead fouling which contributes to greater accuracy, reduced cleaning, and better user health. Each projectile weighs in at 115 grains which is common to the 9x19mm caliber due to its light recoil and flat flight trajectory. The profile matches numerous practice and self-defense loads so that shooters need not worry about point-of-impact shift. 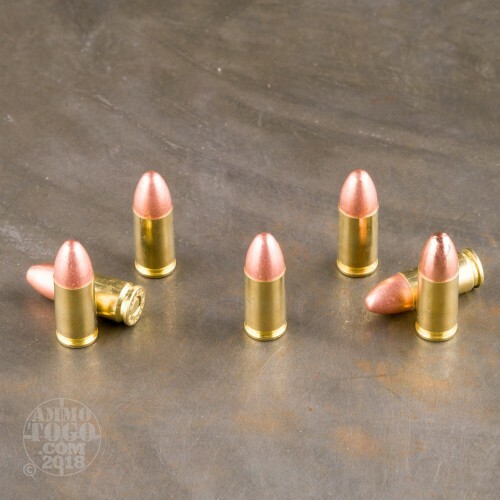 These bullets bear a rounded shape which will feed reliably in any manner of pistol or carbine and even slide cleanly into moonclip revolver cylinders. 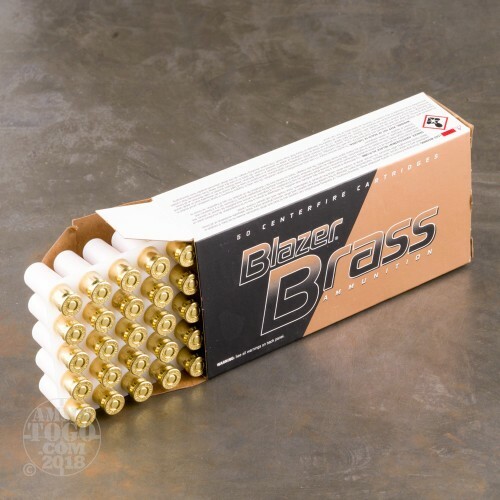 Blazer Brass ammunition is American made and backed by manufacturing experience that reaches back to the early 1960s. No issues to report out of the 750 rounds so far. Functioned very well in my Glock 19. Only seem to have issues with going through them so fast. Great round and great price. I have used Blazer Brass 5200 made in Lewiston, ID for many years in my Springfield pistols and Stemple BMG full auto. I have yet to have a failure to fire. It shoots clean and is great ammo for range use. I highly recommend this ammo. 3 failures in first 15 rounds out of a G43. Can't get much worse. Amazing, I received on time and everything as I bought it. Extremely satisfied. Excellent service all around, good ammo put over 1K rounds through my G19, no problems. Good price and the ammo shipped pretty fast. The boxes aren't as compact as some other ammo I've bought, but overall happy with it. We use a high volume of training ammo of all calibers and keep coming back to Ammo To Go for quality, customer service, and price. Shipping is beyond belief fast (almost counted in hours instead of days), and value is always top notch. Highly recommended for all your ammunition requirements. Very fast shipping! I've run through several thousand rounds of this ammo and have not had an ammunition related malfunction. GOOD STUFF! Good price rounds for target shooting. I shoot these when I run out of the low recoil ammo. This ammo is louder and makes a bigger flash than the low recoil Winchester. posted on 1/13/16 by Nick S.
Fast delivery, great price. Also used with a Glock 19 G4 like many others here, and worked great so far (I'm about 300 rounds into the 1000 and counting...). posted on 9/6/15 by Mike G.
I've had my Gen 4 G19 since Father's Day gift & have mainly used this ammo & have 0 issues! Great price. Blazer Brass works great for me. Quick shipping!! Hard to beat Blazer Brass 9mm for the money. I run this in my Glock 34 with light springs at local matches and wouldn't hesitate to use it in a major match. Zero failures in 1,000s of rounds. Got 2000 rounds in two shipments. Have shot all with pleasing performance. I wish my misses could be blamed on the ammo, but not the case. The ammo is good for the range. Super fast delivery. Exact same ammo sold at my local range, but at a fraction of the price. I look at it as getting 2 free boxes of ammo for not buying at the range. I have shot about 200 rounds so far and, as expected, no issues. Will definitely be back for more! Have shot a few hundred rounds through my Glock 19 and it performed very well and it was a pretty good price. Put about 250 rounds down range. No hiccups. Easy to clean my G-19 after shooting. Recommended. Great price and fast shipping. Will order again!